Bryan Reber and Juan Meng (r.) join a Huan Zheng, chair and professor, Department of Advertising, Shanghai Normal University on the Shanghai campus during a February 2019 visit. 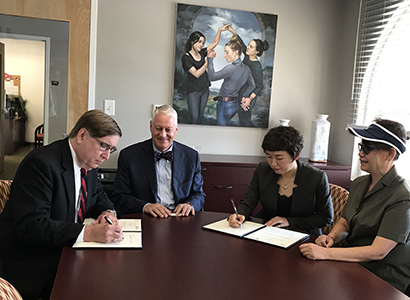 The Department of Advertising and Public Relations at Grady College has entered into an agreement with Shanghai Normal University in China to collaborate on academic programs that will include faculty exchanges, research collaboration, workshops and visiting scholars. This partnership also highlights the first 3+1+1 cooperative education program the Department has established with SHNU. Through this 3+1+1 program, qualified students will earn a bachelor’s degree in journalism and communication from SHNU and a master’s degree in journalism and mass communication from UGA by completing three years of coursework at SHNU and two years of study at UGA. Juan Meng, associate professor of public relations, has been meeting with faculty and staff of Shanghai Normal University to explore possible collaboration opportunities for several years through her role as director of Grady’s Choose China study abroad program. “It is gratifying to see Grady establish a partnership with a major university, in a major city in China, that extends the relationships we have with many industrial leaders and organizations in China,” Meng said. Bryan Reber signs the partnership agreement between the AdPR department and SHNU in September 2018. Looking on (from l.) are Noel Fallows, associate provost, Office of Global Engagement, UGA; Hua Zhang, associate dean, College of Humanities and Communications, Shanghai Normal University; and Huan Zhen, chair, Department of Advertising, College of Humanities and Communications, Shanghai Normal University. This educational partnership will invite students majoring in advertising at SHNU, one of China’s top advertising programs, to apply to study at Grady College, one of the top advertising and public relations programs in the United States. As first year launching the program, a group of three to five students will be selected and admitted to the program. These students will spend their senior year of their undergraduate studies at Grady College before earning their degree from Shanghai Normal University. Once they successfully finished their first year of study at Grady College, they have the opportunity to apply and stay one more year at Grady College to earn a master’s degree from the University of Georgia. Reber and Meng have just returned from Shanghai where they interviewed students for the first cohort starting in fall 2019, and presented some lectures on public relations and fake news. Upon the admission and acceptance, students from SHNU are expected to arrive and take classes at Grady College in fall 2019.